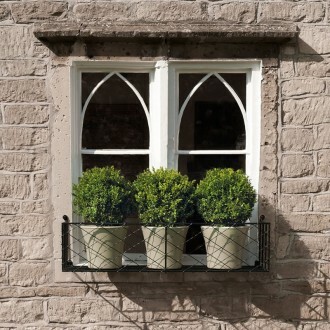 For your instant mini-garden to show off your lovely plants and pots, why not choose our British made window boxes? You don’t really need a window; why not fix our window box to a convenient wall at waist height? Perfect for watering and feeding your tomatoes, herbs or displays of butterfly friendly flowers – no garden necessary. Each one carefully designed and manufactured to a high standard, the solid steel is hot dip zinc galvanized before being primed and painted to ensure a long life. Don’t confuse our product with cheaper garden centre or online products that aren’t of the same quality. Each window box is so easy to install with no assembly required. Fixings are included in the price and we can even make to measure if we don’t have your ideal size. For more information or to place an order, please call Hilary or Joanne on 01225 851577.